"This particular wireless microphone device operates in portions of the 617-652 MHz or 663-698 MHz frequencies. Beginning in 2017, these frequencies are being transitioned by the Federal Communications Commission (FCC) to the 600 MHz service to meet increasing demand for wireless broadband services. Users of this device must cease operating on these frequencies no later than July 13, 2020. In addition, users of this device may be required to cease operations earlier than that date if their operations could cause harmful interference to a 600 MHz service licensee's wireless operations on these frequencies. For more information, visit the FCC's wireless microphone website at www.fcc.gov/wireless-microphones-guide or call the FCC at 1-888-CALL-FCC (TTY: 1-888-TELL-FCC)." New rules now in effect for operating wireless microphones and similar devices will restrict their use in certain bands of the spectrum currently used for television broadcast. As a result, some equipment changes may be needed for local theaters, churches, schools, conference centers, sports stadiums and other users of such devices. Wireless mics and similar devices are designed to tune and operate on certain frequencies known as "spectrum bands." Most wireless mics today operate in the various unused portions of the broadcast television bands, including both VHF and UHF channels. They can be operated on either on a licensed basis, for qualifying users, or on an unlicensed basis, open to all who use the appropriate equipment, provided that users follow the applicable rules for operation on designated spectrum bands. To meet increasing demand for wireless broadband services nationwide, the FCC recently auctioned spectrum that had been licensed to broadcast television stations operating on TV Channels 38-51. The results of the auction (completed in April 2017) will affect the availability of spectrum for wireless microphone operation on the 600 MHz frequencies that correspond to these TV channels, specifically the 614-698 MHz frequencies. Most of these 600 MHz frequencies have been repurposed for new 600 MHz service wireless operations (specifically, the 617-652 MHz and 663-698 MHz frequencies). The FCC has established a time period to help smooth the transition of wireless microphone operations out of the 600 MHz service band to other available frequencies. Specifically, the FCC allows users to continue operations on the 600 MHz service band under certain conditions until July 13, 2020. However, users must not cause harmful interference, either to the existing broadcast television operations or to the 600 MHz service wireless licensees' operations in the band. In addition, users are not entitled to any interference protection from broadcast television and 600 MHz service licensees. Unlicensed wireless mics must not be operated at a power level in excess of 50 milliwatts when operating in the TV bands, and no more than 20 milliwatts when operating in the 600 MHz guard band or duplex gap. 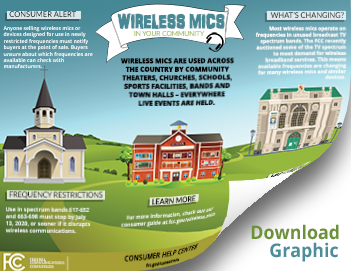 Users are advised to consult their owner's manual or other materials provided by the manufacturer or distributor to determine the output power of their wireless mics. Wireless devices similar to wireless mics include "low power auxiliary station" equipment, which typically can transmit over distances of 100 meters. Examples include wireless intercoms, wireless in-ear monitors, wireless audio instrument links and wireless cueing equipment. Operators of such unlicensed devices should follow the same rules for frequency use as wireless microphone users. Under FCC rules, certain specified entities can obtain a license to operate under specified rules and interference protections. Such entities include licensees of AM, FM or TV stations, broadcast networks and cable-television system operators, and venue owners/operators and professional sound companies that routinely operate 50 or more wireless mics for events and productions at large venues such as large sports stadiums and arenas, music centers, or major theaters. Licensees under the Commission's Part 74 rules may operate in the spectrum bands identified in their licenses. The changes going into effect will require anyone operating in the spectrum that is now licensed for the 600 MHz service (most of the spectrum that was used for TV channels 38-51) to cease operation in those bands and move to other portions of the TV bands (TV channels 2-36) or to other spectrum bands authorized for wireless microphone use. In 2010, the FCC prohibited the use of wireless mics and devices on unused broadcast channels on the 600 MHz service band and on the 700 MHz band – specifically the frequencies between 698 and 806 MHz. It did so because such use could cause harmful interference that disrupts or degrades communications in the spectrum bands that had been repurposed for use by public-safety networks and licensed commercial wireless services. Failure to comply with FCC rules by unlawfully operating wireless mics or devices in the 600 and 700 spectrum bands may result in fines or additional criminal penalties. Public safety licensees may contact the FCC Operations Center 24 hours a day, seven days a week, at (202) 418-1122, or FCCOperationCenter@fcc.gov to report interference. They may also contact the FCC's Public Safety Support Center at https://www.fcc.gov/general/public-safety-support-center. Consumers may report interference with devices operating on licensed spectrum by filing a complaint with the FCC.